After years of cutting a roast duck into rather inelegant quarters I have now discovered the correct way to carve the whole thing into eight perfect portions to serve four people. 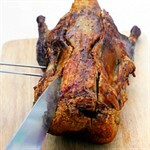 Turn the bird on to its breast and cut down through the meat along the full length of the backbone on either side, then turn the duck on to its back. Next, cut the meat away from the carcass, keeping the knife close to the bone. 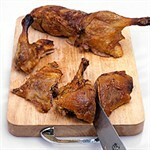 When you reach the base of the bird, carefully cut through the leg joint. 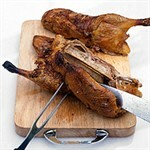 Cut each half of the duck between the leg and the breast, then cut the leg into two pieces at the joint. Finally, divide the breast into two.